The ice fishing season is well underway as cold temperatures have frozen over most of the state’s lakes and ponds. Iowa Department of Natural Resources fisheries chief, Joe Larschied, says you should be able to ice fish in most areas of the state. He says there are still some lakes in southeast Iowa that haven’t fully frozen, but most of the lakes and impoundments have five to six inches of ice on them. The forecast is calling for the temperatures to rise into the 40s in some areas of the state, but Larschied says that won’t melt everything away. “We’re still going to be making ice at night and we are going to be in the 30s and maybe 40s for a couple of days. For a short periods of time they’re not going to be melting a lot of ice. When you have good, hard, clear ice it takes a lot of warming days to really whittle that down,” Larschied says. “I’m going to predict that we are going to be making ice instead of losing ice.” But Larschied isn’t giving a guarantee that all the ice will be good. 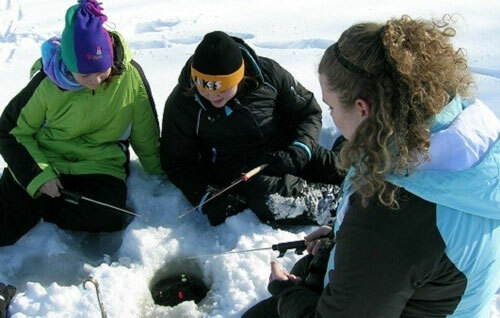 “We can never say it is 100 percent safe to go ice fishing — because the conditions can vary in the lake or impoundment,” Larschied says. “But generally, four inches of hard, clear ice is safe to fish on for foot traffic. Anything of six inches and above is safe for ATVs. And over eight to ten inches is safe if you want to drive larger vehicles on the ice.” He says there are a couple of warning signs that the ice may not be safe. “If the ice looks dark, there’s nobody fishing it, be very careful,” Larschied says. He says you should punch plenty of holes in the ice to test its thickness. And always take a friend with you so you have help if you get into trouble on the ice. He says bring these safety items along in the bucket: ice picks, about 50 feet of rope and a throwable floatation seat cushion for use in case of rescue.